When I was in my early 20s, I read compulsively Mervyn Peake's trilogy, "Titus Groan", "Gormenghast" and "Titus Alone", a remarkable body of work which is, superficially, fantasy writing: Alas! it is too often dismissed as such. In fact, what Peake created was a fantastical portrait of a rigid, class-ridden society on the brink of collapse, a parable for Britain in the early-mid 20th Century. As mentioned before, a gift of a polymer clay owl skull prompted me to create a piece based on an episode from the book in which Sepulchrave, 76th Earl of Groan, is driven to insanity by the burning of his library, the madness leading to him believing that he has become an owl. Overall form of the piece. The skull will sit in the central section and will wear the ruby-set crown. Hand-pierced and carved lettering on a scroll made from found, corroded iron. 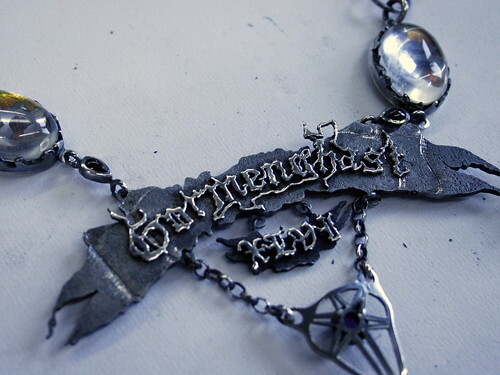 The "lens" elements are natural quartz cabochons, enamelled below and showing the letters "S" and "G" for "Sepulchrave Groan". Closer view of the main piece. The corroded iron key is set with a peridot (tip), a garnet and a natural brown zircon. The section which holds the key is set with a tourmaline. 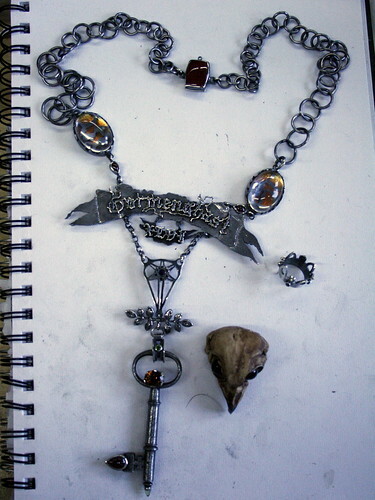 The Section which holds the skull is set behind with an amethyst. 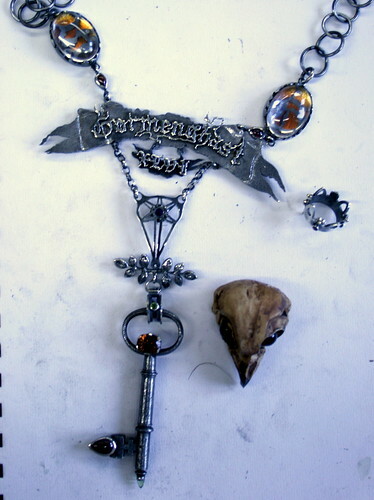 The iron chain is set with garnets, quartz and petrified wood. It is the 100 year anniversary of Mervyn Peake's birth this year, so I'm very pleased that I had the opportunity to make this now.